The Crown Princess docked within walking distance of San Francisco’s Pier 39, The Aquarium on the Bay, as well Fisherman’s Wharf sightseeing options, attractions and mouth-watering aromas. Our California Coastal cruise close to home eliminated last-minute travel tension. After four wonderful river and ocean cruises in Europe, husband Rob and I needed a break from costly and exhausting international travel getting to European ports. A cruise close to home that departed on the west coast proved to be a wise choice. This California Coastal cruise had been on my radar several years. When we found the right deal and itinerary for a 7-day round-trip Los Angeles Princess cruise, we grabbed it. With 3,000 passengers and 1,200 crew members, the Crown Princess would be the largest ship on which we have sailed. Atmosphere on the Crown Princess is embodied in the Piazza. More than a multi-deck atrium, something is always happening in this European-inspired dining and entertainment venue. On the first formal night, the champagne flowed freely during the Captain’s gala welcome reception. These backlit globes are one example of hundreds of attractive art works on the Crown Princess. Dozens of art works depicting European and Mediterranean scenes enhance the Crown’s beautiful interior. Along with customary large-ship features, the Crown has three pools and a large outdoor screen for movies, videos and sports events. Crown Princess provides a bevy of tempting dining options. For lunch we favored the International Café’s specialty salads, quiche and European-style pastries. We chose “Anytime Dining” for dinner and shared tables with Canadians, Brits, Asians, Californians, Arizonans plus other Americans. A culinary highlight was a dinner at Sabatini’s, the ship’s upscale Italian restaurant ($25 per person). Francesco, our skilled Italian waiter, made food and wine recommendations. After a relaxing day at sea, the Crown Princess called on three California ports. In San Francisco, the Crown docked within easy walking distance of the Aquarium on the Bay, Pier 39’s shops and photo ops, many sightseeing options, sounds and aromas of bustling Fisherman’s Wharf. We chose three of City Sightseeing’s hop on/off tours. During our lively downtown tour, Zelda, our seasoned guide, shared factoids, trivia and colorful yarns about San Francisco’s history and current happenings. One of our self-guided tours on an open-top bus included a visit to Sausalito. Pat Woods enjoys inhaling the fresh piney scent of giant coastal redwoods and bay trees while hiking in Muir Woods National Monument. Following our short Sausalito visit, we rode a third City Sightseeing bus to Muir Woods. Our driver skillfully navigated the serpentine road while dispensing fascinating local information. We thoroughly enjoyed inhaling the fresh piney scent of the giant redwoods and other greenery while hiking Muir Woods trails. The heavenly scent of bay trees and coastal redwoods will linger in our memory bank. The trolley driver told us many old talkie movies were shot in Santa Barbara before production studios moved to Hollywood. Today this beautiful city still is favored by the rich and famous. Prices for even tiny modest houses range upward from 1 million. With 500 restaurants, Santa Barbara is a diner’s paradise. Paved walking/running/skating trails run for miles, and beach volleyball began here. The Old Santa Barbara Mission is one of the city’s top tourist attractions and is a stop on the Santa Barbara Trolley. The Mission continues as an active Catholic parish with daily and Sunday Masses. Walking out on the Stern’s Wharf wood pier is one of many fun things to do in Santa Barbara, California. Back at the waterfront, we walked out a long wood pier to Sterns Wharf. At Ty Warner Sea Center, we watched school groups interact with sea critters in touch tanks. We caught a shuttle bus (50 cents for adults and 25 cents for seniors, but crowded with a big ship in port) to the courthouse. An elevator took us to the fourth floor outdoor observation area, a favorite spot to enjoy the view and catch a cool breeze. Tomorrow we’d dock in San Diego. The Crown conveniently docked at a prime spot on San Diego’s waterfront. This beautiful port city had an earlier life as a tuna canning center. When the tuna supply was depleted, the waterfront morphed into today’s attractive tourist area. 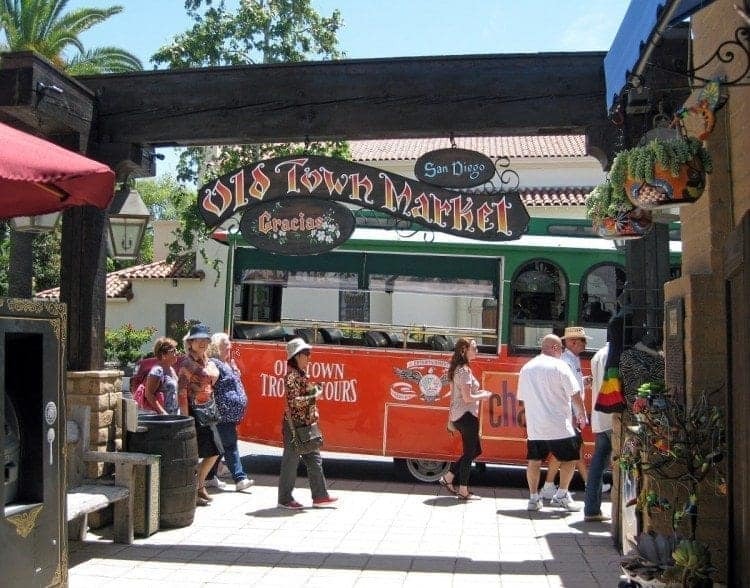 San Diego’s Old Town is one of 11 scheduled stops on the Old World Trolley Tour which covers a 25-mile route. As we did in earlier visits, we opted for the Old World Trolley Tour that travels a 2-hour, 25-mile route through the city making 11 scheduled hop on/hop off stops .Before each stop, well-versed drivers provide witty anecdotes, fun facts, and fascinating tales and weave history with current information on what to expect. Recorded theme music adds to the fun atmosphere. San Diego skyline view shot from the famous Coronado Bridge on an Old Town Trolley tour. Coronado Island is one of 11 trolley stops on the 25-mile route. We got off the trolley at some of the most popular stops. At Coronado Island we walked through the grounds and lobby of the world-famous Hotel del Coronado. We could have spent the entire day at Balboa Park, the nation’s largest urban culture park, home to 15 museums, beautiful gardens, the San Diego Zoo and more. View of the Crown Princess docked in San Diego shot from a Hornblower North Harbor sightseeing tour. The trolley and/or hop on/hop off tours we took all were interesting, economical and enjoyable. The Crown Princess made a final port call to Ensenada, Mexico. We choose to remain on the ship where we enjoyed the pools and other onboard amenities. It was fun to have a birds’ eye view of port activities while we ate a leisurely lunch. The California Coastal itinerary is a great option for first-time cruisers or anyone wanting to avoid the stress, fatigue and expense of international travel. Next year we will search for another “closer to home” cruise. All three California port cities warmly welcome cruisers, have moderate climates and gorgeous natural scenery. For more Princess cruise information, contact your travel agent or visit http://www.princess.com. Based in the Phoenix area, our guest contributor Pat Woods has penned scores of cruise and travel features. Today Pat shares the benefits and cost savings of cruising closer to home. Read more of her stories at http://www.clippings.me/users/patwoods All photos by Pat Woods.